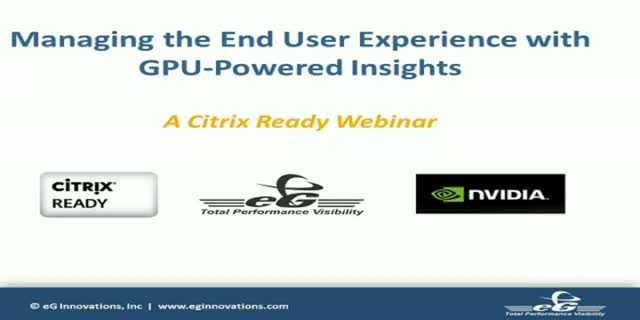 Citrix and Virtual Desktop infrastructures (VDI) are highly performance sensitive. Slow logons, session disconnects and screen freezes are just some of the performance issues that Citrix administrators have to deal with. To deliver the best user experience, administrators must be able to proactively detect and resolve performance issues, before they become business impacting. And when problems do occur, Citrix administrators must be able to quickly determine where the root-cause lies: Is it in the storage, hypervisor, network, delivery controller, provisioning servers, XenApp and/or XenDesktop VDAs, database, or StoreFront? Diverse back-end applications, remote network connections, client capabilities can also add to the challenge of desktop virtualization. More and more of the business and communications of government agencies are now conducted via mobile devices, including tablets and smartphones. While this can enhance productivity, it also poses security and policy challenges. In this webcast you'll learn some of your options for managing mobile users. Whether adopting Exchange Online, or rolling out Office 365 web or native mobile apps, many organizations are still trying to figure out a deployment and user management strategy that spans the mobile cloud. Learn how VMware Identity Manager can simply federate even the most complex Active Directory environments and then automate the provisioning and licensing of Office 365 accounts while users simply login with their existing credentials. Then learn how to integrate Office 365 for mobile platforms with AirWatch Mobile Management to secure data at rest on iOS, Android and Windows 10 devices. Join this session to find out more about what's new with the Horizon portfolio of desktop and application virtualization solutions--including Horizon 6, Horizon Air and Horizon Flex and how these products tie into the software defined datacenter-understand how other customers are taking advantage of these technologies and map out a plan for when to deliver these services through a cloud provider and when to manage these on premises. The retail industry is becoming more complex and changing faster than ever before. Join us as we talk about the latest industry trends and explore how retailers are adopting End User Computing solutions to revamp customer engagement, store operations, employee communication, and security. The blending of our work and personal lives is a reality for many digital employees. While many organizations continue to maintain strong lines of division, other organizations are struggling to find the right balance of security and privacy. This session will review trends, myths and best practices with our own VMWare in-house privacy council for establishing and communicating Bring-Your-Own policies. Microsofts’ Windows 10 offers many new management and deployment features that will help customers move to a mobile-cloud first world. Getting there will be a challenge, as customers will need to re-architect the assumptions, processes, and tools needed for effective EUC management. Most customers will find benefit in deploying a variety of EUC management tools that can deliver desktops, applications, and data in a easy to use and secure way. The promise of a digital workspace is simple enough… Any app on any device with enterprise security and consumer simplicity – But what does that look like for the different types of users in your environment? This session will explore both the concepts of our digital workspace vision as well as prescriptive guidance for what is required in a digital workspace solution to meet the needs of your users. The latest in business mobility straight from VMworld. Find out how VMware can help you embrace and address some of the biggest initiatives in end-user computing and enable true business mobility. We'll share the latest announcements and innovations from VMworld and provide you with an overview of solutions and tools to deliver desktop, workspace and mobile services across devices, locations, connections and clouds. This webcast is designed for IT Directors, IT Managers, IT Practitioners, Systems Admins, Network Admins, Application Specialists, Desktop Directors.